Barry Rosenberg was born in London but moved to Canberra, Australia after completing a PhD on visual image processing. After becoming involved in meditation, he left research to pursue tai chi, yoga, and meditation. Nowadays, Barry lives on the Sunshine Coast, Queensland, where he combines writing with woodwork. He mostly writes speculative fiction. Barry has had a number of stories published and has won a few awards. Pillar of Frozen Light is a work of science fiction written by author Barry Rosenberg. Our central character is Jonan, a man for whom life is a series of excesses and pleasures. He certainly doesn’t live mindfully of others or of the greater purpose of the galaxy, but that is all about to change as he meets the mysterious Yerudit. A woman from a distant colony far across the stars, Yerudit charms Jonan into a wild chase across the galaxy. In his unstoppable pursuit of her, this once indulgent soul discovers the ways of life he’s been missing out on back on Earth and experiences a romance like no other. Barry Rosenberg has created a fast paced and exciting adventure novel for fans of the typical romantic space opera, but with added bonuses of mystery and threat. Though the character development is only really rooted in the two central heroes, this intriguing love story will have readers wondering what kind of world they’ve stepped into, just as Jonan does on his journey. The twists are plentiful and the descriptions are literally out of this world, making this an immersive novel that’s easy to enjoy. Rosenberg’s inventiveness is matched with amusing and snappy dialogue that adds to the overall characterization of Jonan on his journey to a greater state of mindfulness, from a generally selfish person into a being of the galaxy. 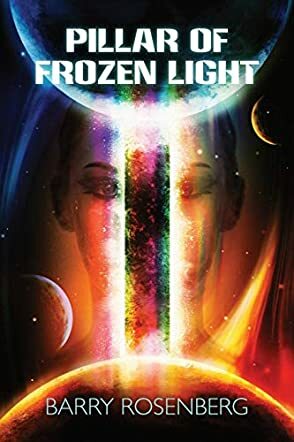 Overall, I’d definitely recommend Pillar of Frozen Light to fans of lighter science fiction and space opera style dramas, but do expect some added calamity for your reading pleasure!